The area of Wat Phra Boromthat in Amphoe Ban Tak is the former site of Ancient Tak City. Lying along the bank of Maenam Ping, approximately 25 kilometers north of the City, the site contains several ruins including the legendary hill-top pagoda in Phum Khao Binth style (of Sukhothai era). The pagoda was built by King Ramkhamhaeng the Great to mark his victory in the hand to hand combat on the elephants back against King Khun Sam Chon, the ruler of Muang Chot (currently Amphoe Mae Sot). 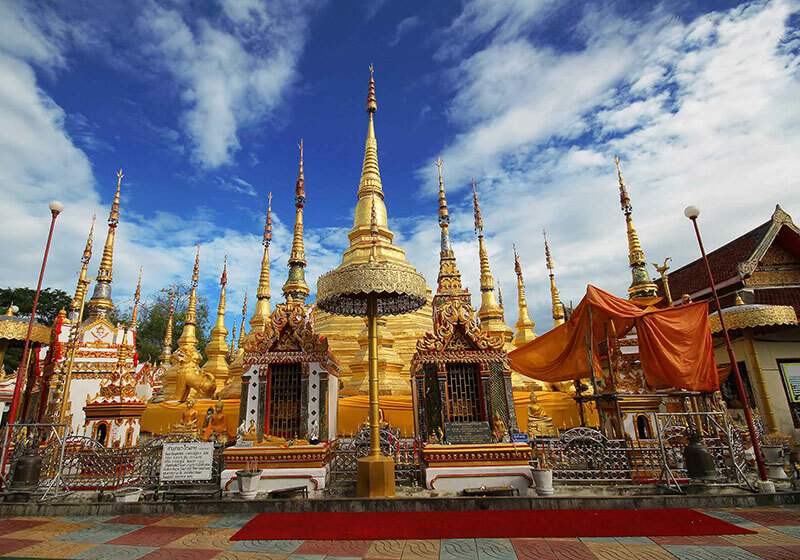 The pagoda shares Myanmar’s famous Chawedagong’s features and houses holy Buddha relics. Locally known as the royal pagoda or Chedi Yutta Hatthi, it is located next to Wat Phra Boromthat. The temple (Wat Phra Boromthat) itself is extraordinary with wooden door panels and roof decorations that are magnificently crafted. In addition, the story of the Lord Buddha is depicted on the temples wooden window panels which are covered in real gold. Short Description: The area of Wat Phra Boromthat in Amphoe Ban Tak is the former site of Ancient Tak City lying along the bank of Maenam Ping, approximately 25 kilometers north of the City, the site contains several ruins including the legendary hill-top pagoda in Phum Khao Binth style (of Sukhothai era).